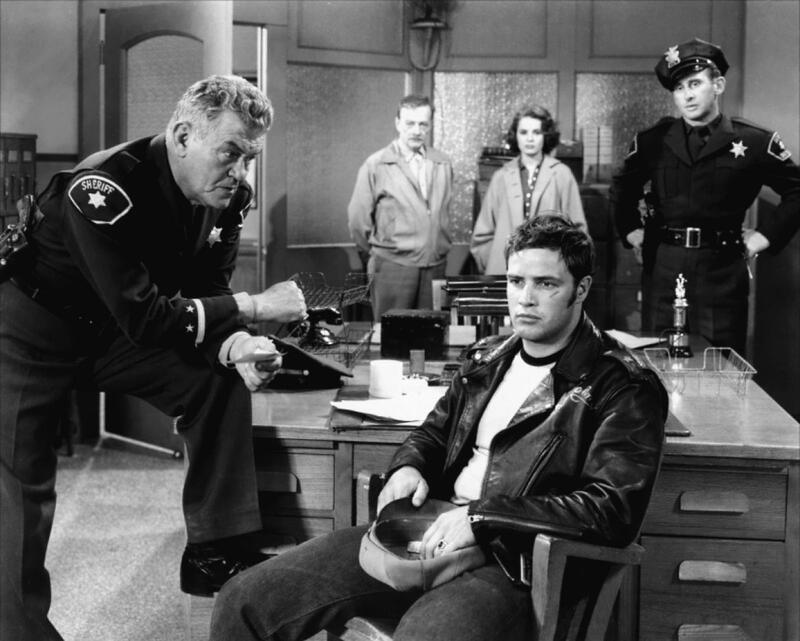 An iconic anti-authority film, The Wild One enhanced Marlon Brando's reputation on the road to superstardom and created the template for the hell-raising, angst-riddled teenager, rebelling against everything and nothing. Johnny Strabler (Brando) leads a group of motorcycle riders known as the Black Rebels Motorcycle Club. Decked out in leather and driving loud bikes, they travel through small communities in California, drinking heavily, kicking up dust and generally causing havoc. At the town of Carbonville, a motorcycle race is in progress and the BRMC members make a nuisance of themselves before one of them steals the second-place trophy and gives it to Johnny. At the next town of Wrightsville, law enforcement is minimal and Johnny and the gang take over the streets. Local girl Kathie (Mary Murphy) works at the one restaurant in town and is the daughter of the meek Chief of Police Harry Bleeker (Robert Keith). Kathie has never ventured out of the town, but Johnnie is attracted to her. Things get a lot wilder when a rival gang led by Chino (Lee Marvin) shows up. With the BRMC tearing up the town and antagonizing the citizens towards vigilante justice, any potential relationship between Johnny and Kathie appears doomed. 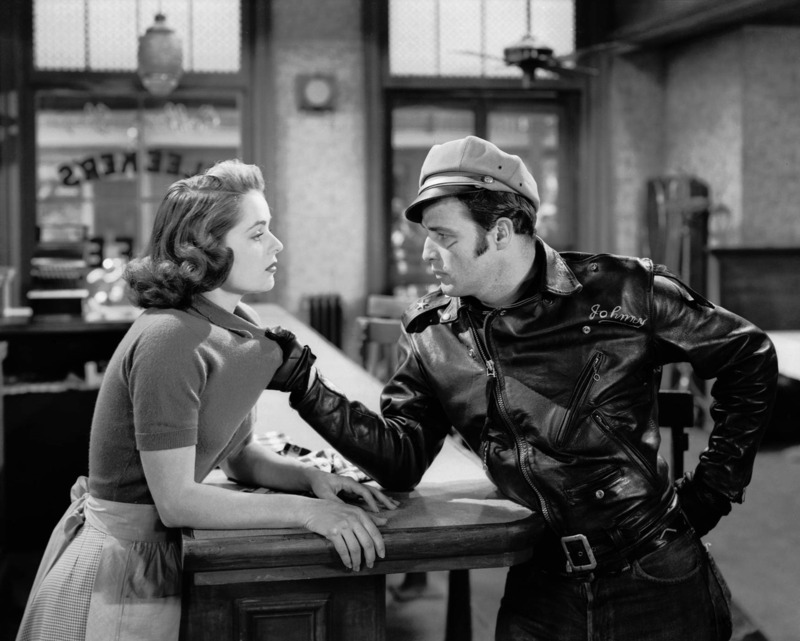 Mildred: Hey, Johnny, what are you rebelling against? Written by John Paxton and Ben Maddow from Frank Rooney's short story, and inspired by actual 1947 events that took place in Hollister, California, The Wild One predicts a collision of generations. Members of the BRMC have no external war to channel their energy towards, and so they direct their anger inwards towards their own society. Their elders know too well the horrors of conflict and are intolerant and impatient with out-of-control youthful behaviour. With no middle ground and no effective arbitration, the threat of youthful shenanigans prompting violence is never far from the surface. With mayhem on the streets, director László Benedek keeps the focus tight on Brando as Johnny, providing The Wild One with a singular focus, and an exploration of a burgeoning movement through an individual. 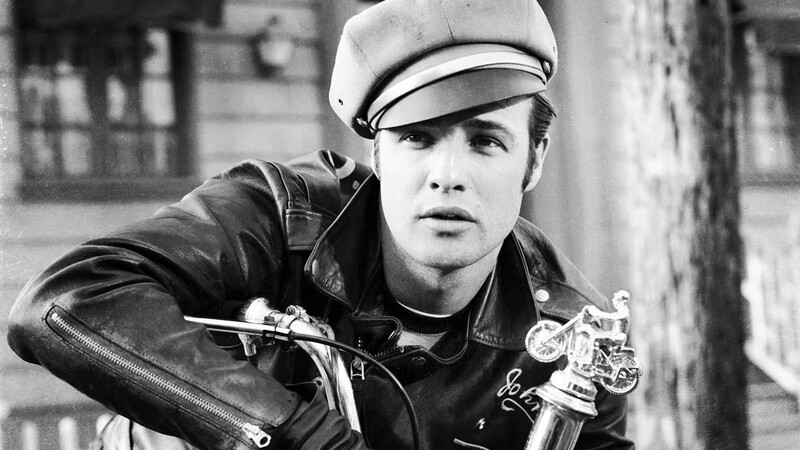 With his leather jacket, long sideburns, cap at an angle, Triumph motorcycle, and unsmiling, rarely reactive expression, Brando defined what it meant to be an angry, misunderstood youth. The source of his anger is never probed deeply, although when he is being beaten by the townsfolk Johnny makes reference to his father punching him. He also obliquely mentions not trusting cops and figures of authority, having been betrayed in the past. Johnny's condition is more important to him than its causes. It's enough for him that he is rebelling, but for people like Kathie reaching out to him, he will remain an enigma until he starts expressing what the fight is all about. The second-place trophy is a persistent symbol of unearned endearment. Johnny never earns the trophy to begin with; he then offers it to Kathie before she is ready to understand and accept him. The equally undeserving Chino demands the trophy, and fights Johnny over it in a metaphorical battle of youth fighting wildly over an undefined prize. Later Kathie asks Johnny for the trophy when he is no longer sure about her. The trophy also gives the movie a slightly upbeat ending, Johnny smiling broadly for the first time as he perhaps finds a glimmer of hope that his version of rebellion will catch with his entire generation. Little did Johnny know that what was outlier behaviour in 1953 would help inspire a shift in all of society's behaviour less than a decade later, as teenage rebellion against normal rules would transform into full-fledged movements in the 1960s, rewriting all the rules. Dangerous in the early 1950s, Marlon Brando's motorcycle and black leather jacket would become normal half a generation later, a symbol of individual independence sparking social renewal.